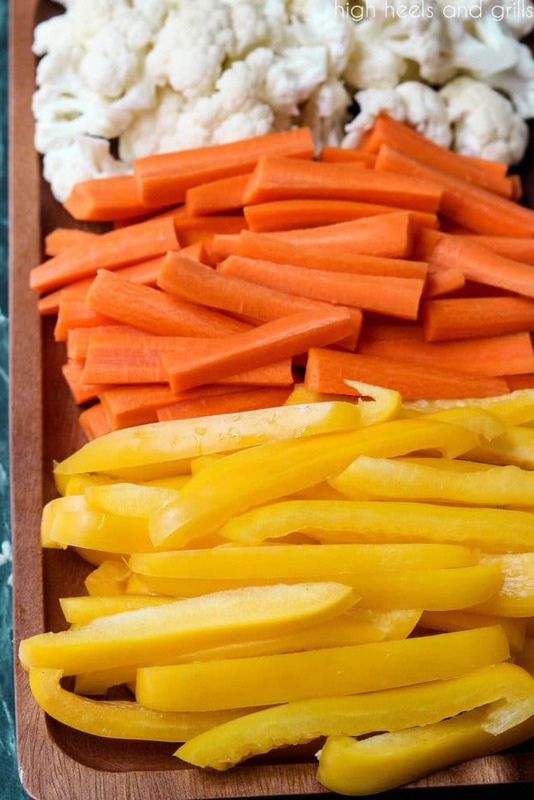 This Candy Corn Halloween Veggie Tray is such a fun option for a healthy Halloween treat! Add a bowl of dip and you have yourself a super easy Halloween party food! If you have been on this blog for about five seconds, then you know that I love holiday themed food. It makes me so happy. 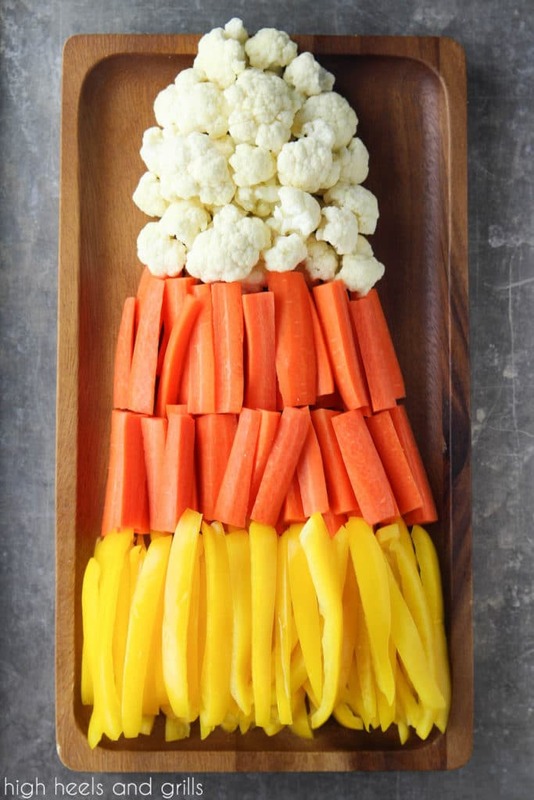 This Candy Corn Halloween Veggie Tray is no exception. It is so easy to put together and looks so cute! If you’re in a pinch and don’t have much time, buy pre-cut vegetables. Just wash them really quickly and throw them on a platter and you have a simple and cute Halloween party recipe! Make sure the bell peppers you pick are more on the yellow side than the orange side. You want them to pop out against the carrots. We like to pair this with a Ranch dip. Our favorite is a 16 ounce tub of sour cream and a Hidden Valley Ranch Dip dry packet, all mixed together. It’s gluten free, dairy free, and dairy free. Basically, unless someone is allergic to peppers, carrots, or cauliflower, you have a great, allergy-free party food! Veggie trays are a crowd favorite. Personally, I like to bring them to parties myself because I know that if I don’t like anything else on the food table, at least I will have some nutritious vegetables that night. It’s just so dang cute. I mean, look at it! Even someone that doesn’t like vegetables wouldn’t be able to deny the fact that this Halloween veggie tray is adorable. 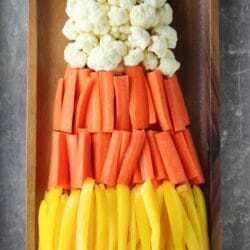 You could also make a cooked version of this Candy Corn Halloween Veggie Tray for family dinner and put corn at the bottom, butternut squash or cooked carrots in the middle, and mashed potatoes or steamed cauliflower at the top. Such fun variations! 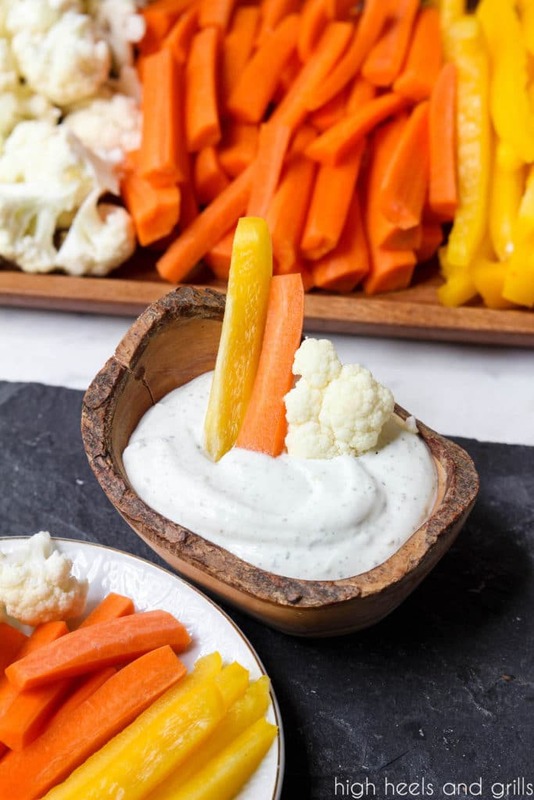 On a large platter, assemble the vegetables in a triangle with the cauliflower at the top, the carrots in the middle, and the bell peppers at the bottom. Pair with ranch dip for some added zest. I didn't include the amounts in this, because you will obviously be assembling it according to the number of consumers. But for reference, I used 3 peppers, 8 carrots, and about 1/3 head of cauliflower in this platter. This is adorable and crazy easy!! LOVE IT. What a super cute, healthy halloween snack idea! With all the candy flying around it is such a great idea to to have something healthy and nutritious on the buffet table! And your wooden sauce bowl is just to die for adorable!! !